Preheat oven to 200°C/400°F/Gas 6. Grease and base line two 18cm/7½” sandwich tins with greaseproof paper. Place the three egg whites and salt in a large, clean, dry mixing bowl. Stiffly beat until mixture is dry looking in appearance. Next add the sugar and beat for a few seconds, then add the egg yolks and beat until mixture thickens and the trail of the beaters is visible. Finally, sieve in the flour and fold it into the thick mixture using a metal spoon. To fold, just cut through the mixture, over and over with the metal spoon until all the flour is blended. Never beat, as it will beat out all the air. Fold in the vanilla essence if used, then transfer to the prepared tins and bake for about 15 minutes. As soon as sponge is baked, transfer to a wire tray to cool. 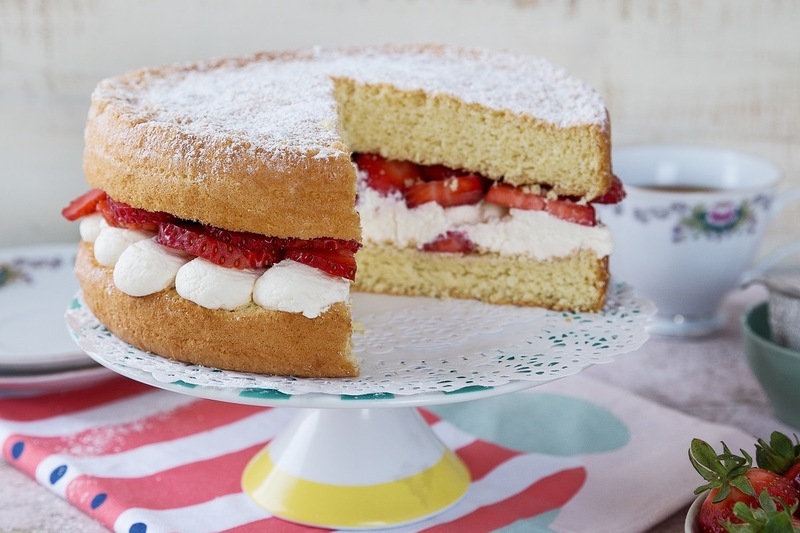 When cold, spread one sponge with whipped cream and layer sliced strawberries on top. Then put second sponge on top to sandwich together. Dust with sieved icing sugar, if desired.